These instruments have a plywood top, back and ribs are laminate. 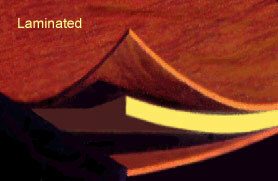 The laminate materials are generally constructed in three layers. The thinner outer layers are made of more expensive woods, while the thicker core layer is made of less expensive wood. The acoustic properties of this sandwich are determined by the core layer wood, while the outer layer wood is chosen primarily for its appearance. This construction is used in less expensive instruments where the demand for quality sound is not as high. An undisputable advantage of laminate construction instruments is their high resistance to damage by physical abuse or by unfavorable climatic conditions. These instruments are widely played by jazz musicians, who take the advantage of their acoustic “imperfections” to create a specific tonal effect. Semi - Solid guitars are instruments with solid tops and plywood backs and ribs. This construction is an acceptable compromise between sound and price. These instruments are constructed with solid tops, backs and ribs. 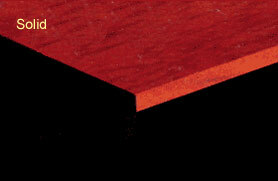 Solid wood provides a complete tonal spectrum. The choice of specific woods and the construction methods influences the final sound of the instrument. Solid wood demands meticulous preparation before and during construction. Because musical instrument requires the highest material quality, solid wood guitars are more expensive. Material, used on master quality instruments, where excellent sound and aesthetic perfection are necessary conditions, is mostly rare and abnormally expensive.